There are so many good open source projects in the Delphi community and most of us can benefit from them. However, it often appears that we are not sure about the usage of a class, a method or a parameter as they are not documented in the source code. Documentation Insight is a powerful documentation tool which can help us visually read and write documentation in the IDE. Many users are very pleased with it. We think it will be great if more and more open source projects are well documented. So if you are the author or one of major comitters of an active open source project, you may have an opportunity to get a FREE license of Documentation Insight. Note: The donated license should be used for non-commericial use in principle but you can get a BIG discount if you wanna order it for commercial use. Documentation Insight is an add-in which helps you visually read and write xml documentation in Delphi IDE. Now the V1.2.3 is released with several improvements. You don’t need to install this version if you have not yet installed Delphi 2009. This version is not intended to be a “final” release, so please don’t distribute it. For RAD Studio 2007/2009, the integration with VCL API Documentation is only for experimental purpose as its structure is not so regular. It works great in RAD Studio 2010/XE. 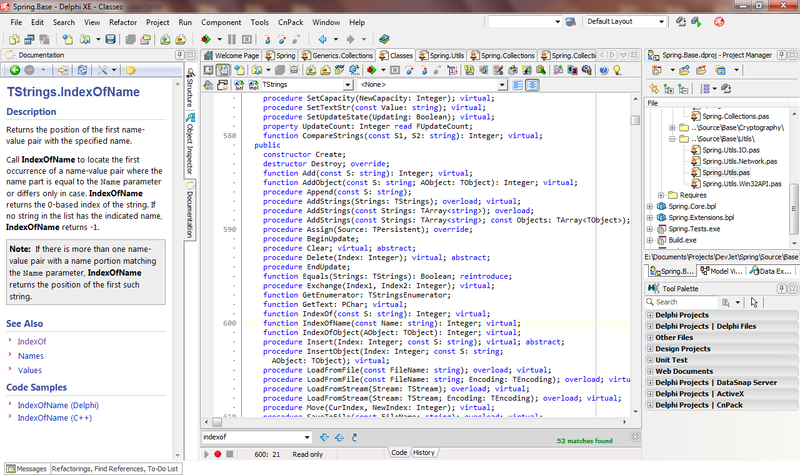 Documentation Insight is an add-in which helps you visually read and write documentation in the Delphi / RAD Studio IDE. It has shipped. Support the editing of <threadsafety> and <preliminary> tag. Provide a customizable template to make Help Insight support the syntax of all tags supported by DI. Note: (*) These two features seems need extra support from Embarcadero since Open Tools API doesn’t provide any explicit function on some certain region. We will do our best to achieve these goals but we have to say there is no any guarantee on this roadmap. If you have any idea or wish, please leave us a message. We are so excited to announce that Documentation Insight ships now. We have updated the website you can download the latest version from the page. It’s recommended that you visit the product page at http://www.devjetsoftware.com/products/documentation-insight/. We made a flash video to demonstrate how Documentation Insight helps you visually read and write documentation in the IDE. # Fixed a potential AV bug when closing the IDE while DI is floating. 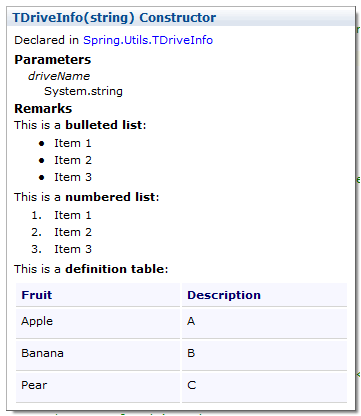 # Fixed the navigation issue when clicking a hyperlink in Vcl doc. You may visit the Downloads page to download the full-functional 15 day trial version. If you can benefit from this product, please purchase a license. We offer 50% discount until Dec. 10th, 2010. You mustn’t miss it. Documentation Insight is an add-in for RAD Studio IDE and it provides a WYSIWYG editor to help you visually view and edit xml documentation. 3. What’s new in Beta 3? > Parameters of a routine, which locates in the implementation section, were missing. We are going to support Delphi 7/2009 and then release the final product. You are welcome to give us any suggestions/ideas. Updated: Documentation Insight has shipped, please visit the product page. 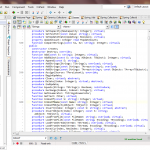 + Integrate with VCL help documentation (Preview). + More region styles (Customizable Caption or summary snippet). + Added a Shortcut Key (It’s Ctrl+Shift+D by default) to show/hide DI. + Added an option to insert line break before documentation to make code look beautiful. * All unknown section tags will be reserved when saving documentation. 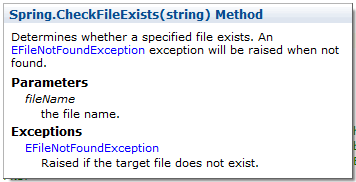 AV exception raised when closing a model view. 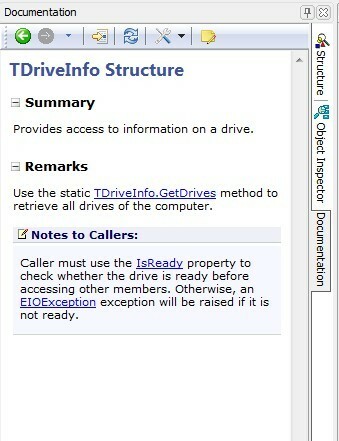 Here is a snapshot to demonstrate the integration with VCL help documentation (Delphi XE). Enjoy it! Note: You need to make sure that your local VCL help documentation has been correctly installed in order to try this feature. 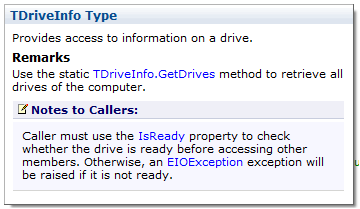 Documentation Insight just extracts necessary information from local help, the copyright of the contents belongs to Embarcadero. We are very excited to announce that the first beta of Documentation Insight is now released! With Documentation Insight, you can easily bold/italic/underline/strikethrough text, start a bulleted list, a numbered list or a definition table, or insert an image, a hyper link, a code snippet or a note block, etc. And Documentation Insight will automatically generate xml documentation and update the source code in a second. It’s so wonderful since you don’t have to remember the complicated syntax and deal with messy xml tags. Note: This version is intended to preview and test. It will be expired on Oct. 31th, 2010. We’ll release a new version before it has been expired. Please see the Release Notes and the Help in the application folder.